The Southwest monsoon onset in Kerala on June 1, 2017 is expected to spread across India by early July. The Indian Meteorological Department (IMD) anticipates a normal rainfall during monsoon season this year as well. 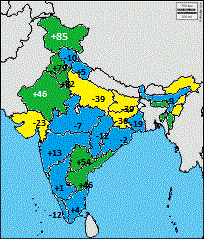 As on June 27, India’s overall rainfall is in (-) 1% deficit. 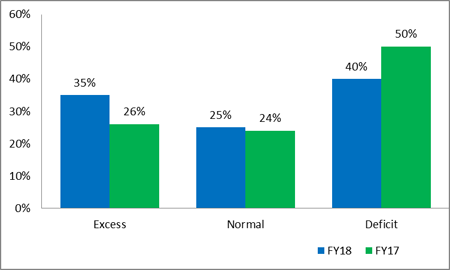 However, there is a marked improvement from last year, as at a sub-division level, only 40% of subdivisions have received deficit rainfall (below (-) 19%) in FY18. This deficit was 50%, the previous year. With the normal rainfall, the food grains production has posted a robust growth of 8.7% in FY17. As a result, agriculture sector also recorded a healthy growth of 5% during the said period. This bumper food production helped in controlling inflation. 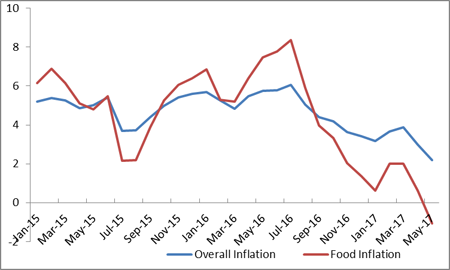 The food inflation had reached 8.4% in July, 2016 owing to a drought like situation in FY16. However, the food inflation decelerated to below (-) 1% in May 2017 due to surplus food production and efficient supply chain management. SMERA expects the food prices to remain in negative territory till Q2, FY18 if the monsoon remains normal this year as well. We believe that the surplus food stock along with higher base factor will keep the food inflation low. The deceleration of food inflation is primarily driven by vegetables and pulses. The pulses production has posted a record level of production with 35% growth in FY17 owing to a higher price level. As a result of higher production and base, price of the commodity decelerated by (-) 10.8% YoY over the past six months. Similarly, price of vegetables has contracted by nearly (-) 11.3% during the said period. Sugar price, in contrast, is galloping at nearly 20% over the last twelve months. Sown area for crops, that were commanding higher prices, the previous year – is expected to rise. It is understood that the agriculture production moves in a hog cycle. The early trend of the area under sown also indicates that production of oilseeds, cotton, and sugarcane is expected to remain high during this kharif season. On the other hand, pulses and rice production is likely to remain low. Similarly, the crude oil price remains soft despite a production cut agreement by the oil producing countries. The rising output in Libya, Nigeria and excess inventory in the United State has pushed the oil price to an eleven month low. 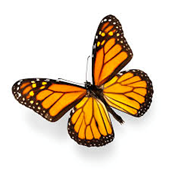 We believe that the oil price to subside further in the near future. The headline (food & fuel) inflation that accounts for 46% in overall CPI basket is likely to keep the overall inflation around lower tolerance limit of RBI, i.e. 4% (-2%). However, the core inflation is likely to remain firm during the early stage of the implementation of GST.